It is no secret that during the 2016 Republican primary season, most conservative leaders – especially cultural conservative leaders – were skeptical of, if not openly opposed to, candidate Donald Trump. With the notable exceptions of the late First Lady of the Conservative Movement Phyllis Schlafly, Senator (now Attorney General) Jeff Sessions, Jerry Falwell, Jr., Gov. Sarah Palin, Michele Bachmann, Pastor Paula White, Darrell Scott, former Pentagon official Joseph E. Schmitz, and Iowa’s talk radio star Sam Clovis, most conservative leaders chose to back another candidate or were silent. But once Donald Trump won Indiana, and the bruising primary season was mathematically over, the Trump team – and President Trump himself – made a slow, but concerted effort to woo conservatives into backing the apparent Republican nominee and to suspend their skepticism that Donald Trump would govern as a conservative. A key part of that campaign to prevent social conservative leaders from joining the #NeverTrump campaign was that – if elected – Donald Trump would govern as a conservative and staff his administration with conservatives, and that social conservatives would have key roles in his administration. I was privileged to serve on the steering committee brought together by Bill Dallas, who leads United in Purpose, and the leaders of MyFaithVotes.org that organized a series of meetings in mid-June of 2016 between then-candidate Donald Trump and cultural conservative leaders, activists and thinkers. During those meetings, then-candidate Donald Trump represented that he intended to govern as a conservative and that an important element of his agenda was to appoint constitutional conservative judges, and by implication, other pro-life, cultural conservative policy makers to his administration. These meetings were an important turning point in getting conservatives to support Donald Trump’s campaign, and many conservatives then put their personal credibility on the line, came out publicly for Donald Trump, donated to his campaign and activated their personal networks to work for and vote for him. And as the campaign kicked into overdrive during the summer, everywhere we conservatives looked, we saw Donald Trump surrounded by movement conservatives and movement conservatives in charge of the campaign: Mike Pence, Kellyanne Conway, David Bossie, Stephen Moore, Larry Kudlow, Senator Jeff Sessions, Steve Bannon, Stephen Miller and others from the conservative movement were the team that helped Donald Trump achieve his unprecedented victory. However, what I have observed and heard since the inauguration leaves me concerned that many cultural conservatives who put their credibility on the line to give their post-primary support to Donald Trump and gave their time, money and expertise during the general election campaign are now being systematically excluded from the Trump administration, while prominent #NeverTrump campaigners are being hired. Two examples known to me will illustrate the problem. The first, a prominent and highly respected social conservative who was asked to join the administration to fill an important sub-cabinet post, who after an exhaustive (and expensive) financial disclosure process and informing their clients of the prospect that they soon would no longer be available to serve them, was rejected by the Office of White House Personnel for a factual one or two line primary election season comment critical of a Trump family member. The second, a prominent thinker and writer on matters of national security was similarly urged to apply for a position in the administration, and subjected to a lengthy and expensive vetting process, only to be shot down by White House Personnel for writing, accurately, that then-primary candidate Donald Trump had apparently flip-flopped on an issue of interest to conservatives. Contrast the treatment of these two conservatives with the hiring of Helen Aguirre Ferre, now the White House’s Director of Media Relations, who previously very publicly—as an adviser to former Florida Gov. Jeb Bush’s failed 2016 presidential campaign and as a GOP consultant after Bush dropped out of the race—bashed Trump repeatedly on the campaign trail, and became a leading voice in the #NeverTrump movement. As Breitbart’s Matthew Boyle reported, Aguirre Ferre’s perhaps most egregious Never Trump comments came via Twitter on March 11, 2016, in a since-deleted Tweet in which she said now President Trump “bears responsibility” for violent riots in Chicago that forced him to shut down a campaign event there ahead of the Illinois primary—which he handily won on March 15, sweeping many other states that day. The Washington Post recently outlined how the hiring process allegedly works and how the numbers are stacked against hiring a cultural conservative, while ensuring that establishment Republicans and even Democrats have an advocate on the hiring board. "Around the table for weekly hiring meetings are chief strategist Stephen K. Bannon, representing the populist wing; Chief of Staff Reince Priebus, leading the establishment Republican wing; White House Counsel Don McGahn; Pence’s chief of staff, Josh Pitcock; and Jared Kushner, the president’s son-in-law and senior adviser, representing a business-oriented faction, according to a lobbyist and several White House officials. 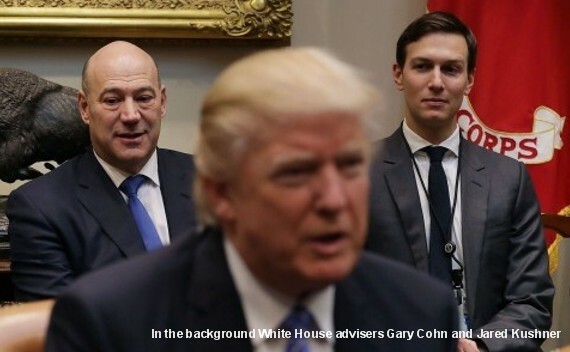 For economic appointments, [Democrat] Gary Cohn, director of the National Economic Council, also sits in, as does the president’s daughter, Ivanka Trump, when a hiring decision piques her interest. Except for conservative populist Steve Bannon, it would appear no conservative has a real say in White House Personnel. Don’t get me wrong, some conservatives have made it into the Trump White House and the administration. However, as we reported in our article “Establishment GOP Seizes Most Important Job In Trump White House” the head of White House Personnel is John DeStefano, a longtime John Boehner and Reince Priebus acolyte, and with New York liberal Democrats, such as Economic Advisor Gary Cohn, having veto power, many conservative rock stars whose support and money were good enough for the campaign are finding that, after they put their personal credibility on the line to help elect Donald Trump, they are now being excluded from the Trump administration. Can Cultural Conservatives Serve In Government? Submitted by rebelsailor on Sat, 05/13/2017 - 00:07. For anyone that watched Sarah Palin's 2015 CPAC Speech which the main focus was the problems of the VA it would be obvious that candidate Trump cloned his speech's about the VA after what Sarah Palin had said. Many of her supporters backed Trump because of her endorsement. Without the Palin endorsement before the Iowa primary the election would have played out much differently. Plus she took much hate from the Cruzers for backing Trump. re-tread who was part of the problem at the VA. At least last month Sarah had dinner with President Trump and she brought a few friends. Still think that Ivanka or Priebus vetoed a Palin appointment. Submitted by email_registrat... on Thu, 05/11/2017 - 14:01. I partially understand your complaint, but I have some questions and statements. -Don't you think some "never Trumpers" will help reduce old guard Republican backlash? -Isn't the overarching point of this term to pass corrective legislation? -Is the point of this administration to begin redirecting the liberal avalanche? Or is it just to see how many friendly faces he can choose. -Isn't this supposed to be an end to the greased palm method of choosing officials? -To read between your lines, Trump owes people positions just because they supported him. I thought conservatives disliked cronyism. -It took a long time to get in a hole this deep and this "my way or the highway" approach is part of the problem. -I don't think Trump missed the point, but maybe you did. Remember, he hates whiners. The best way to make sure you don't get a spot is to whine about it.